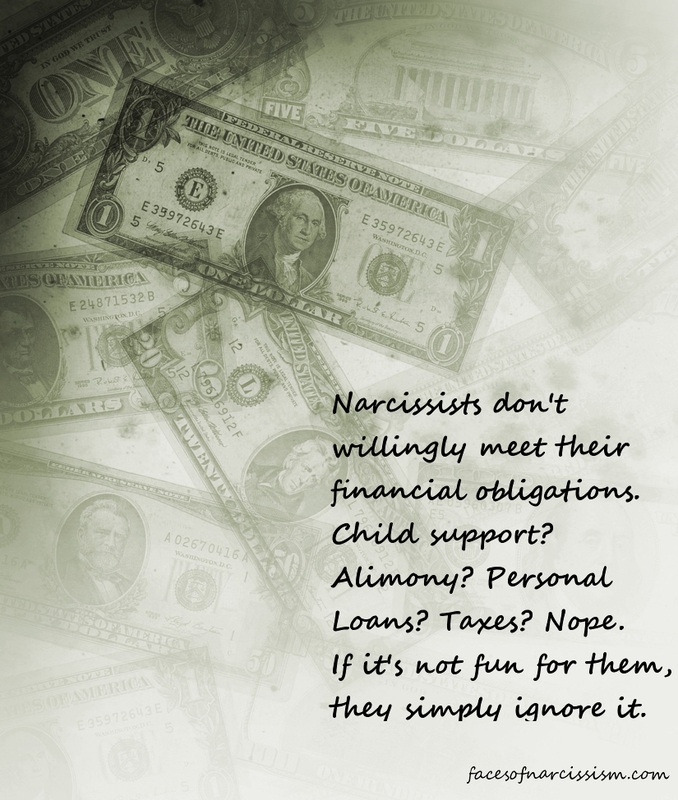 Narcissists don’t willingly meet their financial obligations. Child support? Alimony? Personal Loans? Taxes? Nope. If it’s not fun for them, they simply ignore it. If a narcissist owes you money, you will probably never see it without a fight. They simply do not feel like they should have to pay for things that aren’t directly benefiting them. They just do not understand the basics of integrity and honoring commitments because all they can think of is their own personal gain and pleasure. They don’t care who they hurt and they don’t care if their refusal to pay destroys someone else’s credit. This includes child-support. They do not care that their children suffer when they refuse to pay. They don’t think they should have to pay in the first place. If they do pay, it is almost always because their wages are garnished, and when that happens, they feel entitled to something. I noticed with my own narcopath ex, that he refused to pay for over a year and at the same time, he was refusing to see my son. As soon as he started seeing my son regularly, he started making some payments. I guess he felt like if he wasn’t seeing my son, then he didn’t have to pay. Funny, because I still had to pay for shelter, food, childcare, clothes, baby gear and more every day that he didn’t feel obligated to pay! Those of us who share a child with a narcissist have to learn to lean only on ourselves because the other parent is never going to be reliable without some benefit to them. You simply cannot depend on a narcissist for your monetary survival. Just because the law, or honor says they owe you doesn’t mean they are going to pay. Now a narcissist might pay their mortgage, their car loans, their insurance and other things that affect THEM, but as soon as those things aren’t a benefit to them, they stop paying. For example, if you are getting divorced and the narcissist is ordered to pay for insurance for your kids, or your mortgage payment, they might let it slide. I have a friend whose narcissist husband purposely let their house get foreclosed while he stashed money in hidden bank accounts and claimed he was broke. Never mind that his children were living in the house…. He just didn’t care about anyone but himself. Same thing with alimony, divorce settlements, personal loans, and more. While most of us feel like we should honor our obligations–especially to friends and family–narcissists are lacking that integrity. They think nothing of spending lots of money on themselves while the people they owe money to struggle, but they don’t have empathy to see what their selfishness does to others. So if a narcissist owes you money, don’t depend on it or expect it. They will go to great lengths to avoid paying you! Haha…pretty much write it off and file it under don’t make this mistake again… lesson learned! Even if you have proof and the court awards you they WON’T pay a penny to you because they think they are above the law! Even if you have a court order saying that they owe you! You’ll NEVER and I repeat NEVER receive anything from them except a phone call, email or text saying that they want to “talk”! It’s their sick and twisted way to try and worm their way back in (because they owe you money) to your now happy life without them! Even though they are with someone else they want you on the back burner just in case it doesn’t work out, they are bored, they became exposed or just missing what they once had yet tossed away like yesterday’s trash! They are thinking ONLY OF THEMSELVES and NOT you! DON’T FALL FOR THIS TRAP!!! Think, if this is how they felt then why did they do what they did in the 1st place? That’s because they owe you something and they are trying to get out of paying you! Do you really think the courts care? The answer is NO! Take my ex for example…he owed 9 years of back child support to his mistress whom he had a affair with while married to his 1st wife. His adultery was her fault! The unpaid child support was my fault even though I said I could help him pay it and get caught up. He got abusive over it! He made $2,000 more a month than me yet he couldn’t pay it?! His new supply supposably paid the $10,000 of back child support so he could renew his passport and get married! Again this clearly shows that he uses women to his advantage and he’s a parasite attaching himself until something better comes along! Exactly! They will NOT PAY! They can have umpteen judgments, liens, back taxes, owe this supplier that supplier, their ex wives, owe court ordered this and that and they don’t give a flying flip!!!! They will LIE LIE LIE and ABUSE ABUSE ABUSE! Especially those in real estate, construction, or developing! Forget about it! You won’t see a DIME! Nadda! The system is broken, quite frankly my ex business partner should have been thrown right in jail instead of being allowed to roam freely to victimize more and more people! My cats and I are happy not to have him in our lives as he mistreated, mocked and put us down all the time! First, thank you for sharing and making a place available for others to share. Second, i’m sorry you had to deal with narcissism up close and personal. It’s quite a horrific experience. Everything you said, i can relate to and agree with. My husband does NOT like to pay bills unless it effects him somehow, like child support. He wouldn’t pay support to the mother of his child unless it was court ordered and taken out of his paycheck every week. AND then, he stopped working, eventually the court threatened to suspend or revoke his driver’s license if he missed one payment. Well, he’s been making on time monthly payments without it having to come out of his paycheck ONLY because without a license he will lose his job. AND he can’t lose this job because he uses the company’s customer base as his personal hunting ground. He also does not have a boss who is hovering over him all the time, he’s independent and works alone most times with a lot of out of town driving, making it really easy to have and maintain multiple relationships outside of our marriage. The other thing is he makes alot more money than I do but will not give any more than he must and even then, the hell i had to go through to get him to pay his share of living expenses was quite an ordeal. Once he started working again, he was handing over money when he felt like it and any amount he thought was good enough. He refused to sit down and create a budget with me and when i asked him to manage the finances, he refused that too. I know now why he left me in charge of the finances, one – because he didn’t want the responsibility, two – he said it was too stressful and he didn’t have the time or patience and three – he’s been telling people i’m financially abusive! He still owes me $18 from last year, not to mention other money he stole from me and the house money to cover for his irresponsibility with his own money. I was out of work due to surgery recently and ended up having no income at all. Foolishly I expected him to cover the expenses until I return to work which I had done for him when he was out of work 6 months our first year of marriage, i carried him. Another 8 months when he was out of work again the next year and 14 months when he was out of work again the following year. BUT No Way will he cover for me while out of work for 2 months because I was unable to work due to major surgery. Heck, he didn’t even go buy any medical supplies for me that the doctor told him to get me. I had to wait until I was well enough to order everything from the internet and have it delivered! AND I had to borrow money from my parents all while he had more than enough money to cover everything for a short time. These people are awful. I feel bad that they went through some pretty horrible circumstances in order for them to become this way BUT I no longer pity these people. A couple of months ago, my Narc promised to pay rent and utilities until lease is up in June, and our car payment until it was done. I have been out of work due to an ankle injury, but am looking again. He has not put any money on our account for 3 weeks, rent is overdue, car payment, utilities. However, had to go to exparte hearing, didn’t think he would be there; not only was there, but had an attorney. I walked by him when no one was looking or close and said “Oh, you can pay an attorney, but not your bills.” After court i get a blocked call, knew it was him, the next day i get a message from his,Dad’s phone, his Dad never contacts me. Anyway, i found out today that he paid the rent, and called utility company, only to find out he promised to pay this week. I keep getting calls from the same out of state numbers, but they don’t leave a,message. I am just curious, I know the phone calls and texts are hoovering, but is paying bills that are past due also a way of hoovering, since he had previously changed his direct deposit and stopped putting money in our account? I feel like it is hoovering, but I could be wrong. I am almost 100% sure my ex is a narcissist. He used gas lighting throughout the majority of our 9 month relationship. He was very unfair in the relationship. He would scrutinize the hell out of the smallest things with me but would do way worse on a regular basis. For ex… he could call me at midnight and if I didn’t answer it was the worst crime, however, he could be ghost for hours and it was ok. He often made very poor decisions that made absolutely no sense. And when I finally realized he was cheating he showed absolutely no remorse and his demeanor was as if he was saying how dare you catch me in my lies, deceit and cheating. But, the few times that I let him borrow money I absolutely never had a problem getting the money back. In fact he would insist on paying me in full when I suggested making payments. He also gave me very thoughtful gifts which is a contradiction to the typical narc. This really puzzles me and is one of the main reasons it took a while for me to realize he was in fact a narc. My ex narcissist used ALL money and now I can’t pay my bills and I have a failure to yield ticket due to be paid at court in 3 weeks. I have no one to help me. I wish I’d known about what narcissism really was before marrying my ex – OBVIOUSLY. I think there should be a class on it so we can avoid it because the narcissists will never realize it in themselves anyway. My ex owed more than $10,000 in arrears so I had to take him to court which brought it down but was worth the effort. My problem now is getting him to pay THAT judgement. It is amazing to me to read about all the typical issues of the narcissist – we went bankrupt, he didn’t pay his portion of a tax debt that we got because he didn’t follow through on filings so we owed $40,000+ (which wouldn’t have been the case but I was unaware that he also didn’t bring in the paperwork or the accountant because “he didn’t want to pay $350). I WISH I was kidding. I paid my portion and now the Feds are also taking his portion out of my account monthly because he didn’t pay in time and they don’t care who it comes from. It’s amazing how exact it all is. He also had over $80,000 on credit cards that I didn’t know about but I was also responsible because we were married – that makes no sense because if your name isn’t on the card, you can’t even find out how much is on it and he definitely wouldn’t tell me. Thus the bankruptcy. OH! He also took $50k out of his 401k that I wasn’t aware of but found out about in the divorce. It’s crazy. I think courts and judges should be more aware of what narcissism is and how to deal with them. Maybe require a psych evaluation – I know my ex’s picture would have been right next to the word in the dictionary. He won’t pay for anything over and above the measly court ordered child support and took me to court several times to get it down to what it is. The kids see it, that’s the sad part. You can’t say anything to the narcissist about it either because they will just go after the child and try to yell or argue about how you are just trying to make them look bad or yell at the kid about what they said – that’s not worth it. It’s truly amazing how their minds work. You can’t make it up – and people who haven’t dealt with it can’t believe it.